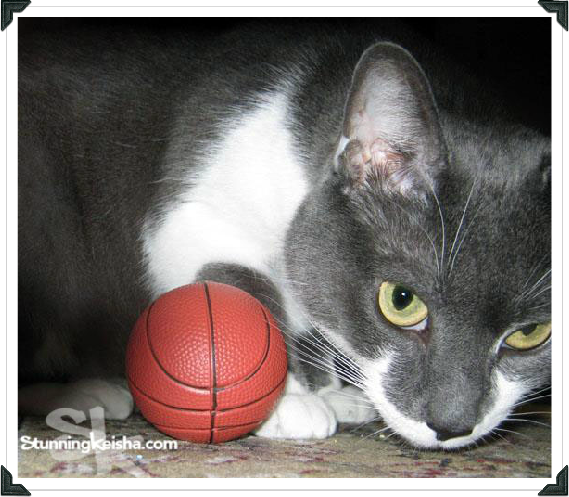 Fall is the time of year when a ghetto cat’s fancy turns from baseball to b-ball. They say when cats fall, they always land on their feet. I’m here to tell you, that’s not the whole story. The truth is cats never fall. Read it and weep. That time Faith “fell” out of Gramma’s second story window? I’m sure she knew what she was doing. (No cat was hurt.) At least that’s what I’d like to believe. I’d like to believe that cats aren’t as clumsy as, say, my Pop. I love Pop but he could fall over his own two feet—it’s a good thing he doesn’t have four like us. In fact, if he squats down to pet me, he’ll topple backward and he doesn’t even drink alcohol. You guessed it! The 52 Snapshots of Life theme for week 45 is Fall. Fall as in Autumn and here’s Autumn now modelling her coat of Fall colors. 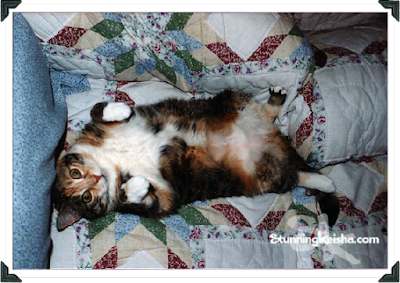 You might recognize that quilt that she’s laying on from yesterday’s blog post. 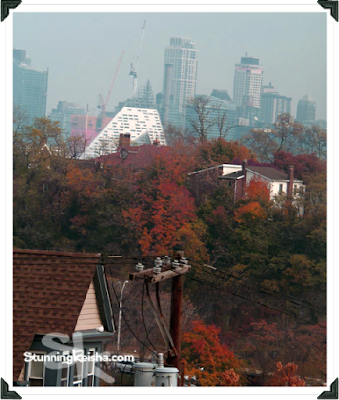 Speaking of Fall colors, TW took this pic from our window to show some of the foliage around here. Do you see that white building shaped like a pyramid across the river in NYC? That’s the creation of architect Bjarke Ingels, located on 57th Street. I’m sure you have to marry a millionaire if you want to live there. She did enhance the colors a wee bit cos the glass from the window and the gray day sorta muted them in the camera’s eye. Thanks to Christina and The Lazy Pit Bull for hosting the 52 Snapshots of Life photo challenge this week and every week throughout 2015. For those who would like to participate, next week’s theme is Veteran. I’m gonna have to think on that one. Time to get arty and strut my creative talent. When TW was looking for a good lead pic of me to depict Fall, she decided that I should pose with some records cos the song was called Fall on Me, just like this post. What a coinkidink! The resulting pics were all fails so we turned one of them into art. This first one is a double exposure in Photoshop using the pic of me and one of the colorful foliage. She masked me out so I wouldn’t turn into a calico. MOL! This one is a PS Digital Drawing. No Fall colors but you can clearly see the word “fall” on the record. First a Glow action and then the Intense DD action. How about you? 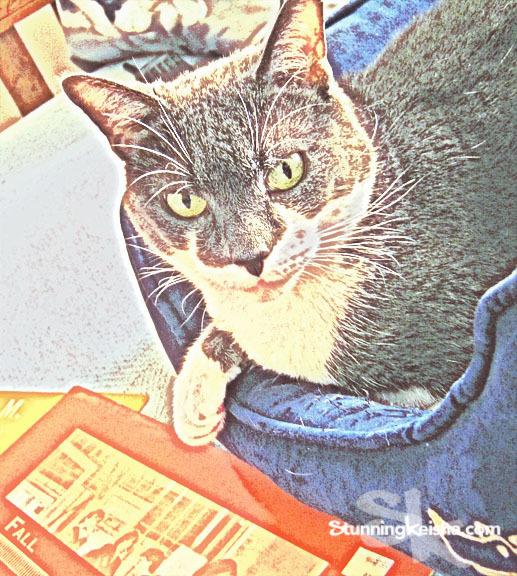 Are you gonna fall for any of your human’s antics the weekend? Wow, what pretty fall colors! And you look good framed in them, too! The only thing I'm plannin on fallin for is BACON. My human is so bummed she didn't have more time in New York - she really wanted to come up and visit you! Oh, and your humans too. You are pure and stunning art CK! Wow, the trees look so pretty! Our trees aren't really turning colors - it's a bummer. The Fall colours are very pretty. I like the digital drawing too. Beautiful everything today CK. Love TW's pic of the fall colors. Looks like here. Ours are almost all on the ground now and we're patiently waiting for the lawn guy to come and clean them up. Don't feel too sorry for him, he has a small tractor with a picker upper thing attached. All he does is ride on it and steer it. You be lookin' pawsum CK. And so is Autumn. Hope y'all have a gweat weekend. 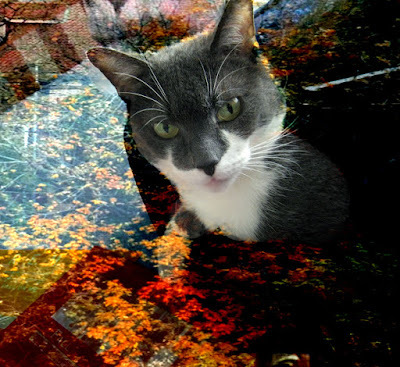 Fall is gorgeous as your picture for Artsy Caturday. I am here to tell you that cats do fall and don't always land on their feet. Kali fell while walking on the railing in front of the basement stairs. She landed on her face and was very embarrassed. She got a swollen nose out of it too. She has never tried walking on the railing again. Your blog is looking very fall-like, CK. CK! Grrl Furrend! LOVE LOVE LOVE Your post! What a great view you have. Its always nice to have a view. Autumn's fall color coat looks beautiful! And you've got such a gorgeous view from your window. Well, you've certainly got the "fall" theme covered from every direction....great job! Our house used to have a loft area with only a railing along the edge. Our cat Katie loved to walk along that narrow rail...she made me so nervous. But she never fell! Most cats are far more graceful than us humans. You're always so creative with your artwork. I wonder how many cities have pyramid buildings. We have one here but I don't think it was designed by anyone famous.